In a strange turn of events, the first single from the new Masked Intruder album includes no references to burglary, trespassing, or other unsavory activities. However, that doesn’t mean they’ve lost their charm (or their gimmick). “The Most Beautiful Girl” is a cute, straightforward love song with crunchy guitars and a chorus that is destined to be stuck in your head all day. You can check out a lyric video for the new song after the break, and this is one lyric video you will actually want to watch. 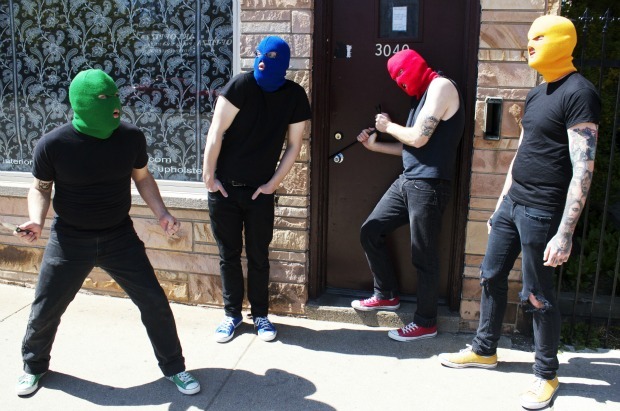 In typical Masked Intruder style, the clip includes some subliminal messages about love, the new album, and, of course, robbery. If their advertising tactics haven’t worked on you yet, head over to Fat Wreck Chords right now to pick up a copy of M.I. Masked Intruder have a staggering amount of tour dates planned for the rest of spring, summer, and early fall. Between an Australian festival tour, a US run in the summer, and a substantial European trek, there’s a good chance the four masked men will be making an appearance near you this year, and you won’t want to miss it.